Europe is to get its second Hard Rock Hotel this Autumn with the opening of a new property in Tenerife. The move follows the successful launch of Europe’s first Hard Rock Hotel in Ibiza in May 2014, and sees Palladium Hotel Group aligning with Hard Rock International, owner of one of the world’s most recognised and iconic brands. Due to open this autumn, the new beachfront resort is a total renovation of the Spanish hotel group’s Fiesta Hotel Playa Paraíso complex and is located on the Canary Island’s southern coast near Adeje. The hotel will offer family-friendly and adult-only experiences through its five-star facilities and services, while reflecting the immersive music environment for which Hard Rock Hotels & Casinos are known. A total of 624 rooms, including 266 suites, will be split across two towers – Oasis and Nirvana – combining contemporary interiors and lavish amenities radiating style and energy. The Rock Royalty Level, located on the 14th, 15th and 16th floors of the Nirvana Tower, will house rock star-worthy suites offering exclusive services such as a private concierge and VIP check-in. 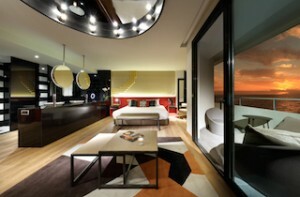 Guests will also enjoy privileged access to a private lounge on level 16, boasting amazing views of the Atlantic Ocean. The Rock Star Suite will offer 154 square metres of extravagance with incomparable sea views from a glass-walled terrace, as well as a stylish 50 square metre living room and master bedroom. All this will be complemented by Hard Rock International’s priceless collection of music memorabilia, which will be displayed prominently throughout the hotel. The hotel’s guests will be able to choose from wide array of leisure options, including three pools, access to a natural saltwater lagoon and a recreation area featuring a concert arena, main stage for visiting artists and a beach club complete with Balinese beds, all just steps from the property. The hotel will also boast signature Hard Rock facilities including a Rock Spa, Body Rock gym and world famous Rock Shop featuring Hard Rock’s exclusive merchandise specially designed for the Tenerife hotel. Additionally, a 620 square metre convention centre with state-of-the-art technology will host up to 525 people for meetings and events. Six restaurants will offer a huge selection of culinary delights from around the world, and the rooftop sky lounge bar will provide views across the island, from Mount Teide, Europe’s highest volcanic cone and Spain’s tallest mountain, to the lesser known Canary Island of La Gomera. The impressive bar terrace, which is open to the public, will offer a varied cocktail selection and live music, set to be one of the best spots on the island to enjoy the magnificent sunsets. Hard Rock Hotel Tenerife will offer guests an immersive musical experience, relevant to all generations, with an energising event programme of live concerts at the hotel’s open-air stage area, adjacent to the seawater lagoon with a capacity of 5,000 people. DJ sessions, acoustic bands and vocalists will also play in various parts of the hotel throughout the day.